They say that bad things happen in threes. They are almost always right, as for the third time in two weeks, the heavy metal community finds itself mourning one of its own. 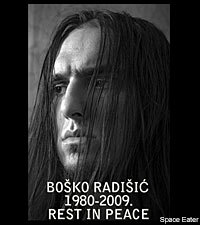 According to various online reports, Boško Radišic, who fronted Serbian thrash metal outfit Space Eater, was killed Tuesday (June 2) night in a fire that consumed his Belgrade apartment. The 28-year-old singer was also a student, and considered a leading figure in Serbia's thriving metal scene; investigators claim Radišic, formerly of After Life, died from smoke inhalation. His 25-year-old sister, Marija, also perished in the blaze. Space Eater, who took their name from a track that appears on German power metal act Gamma Ray's 1990 LP 'Heading for Tomorrow,' have yet to issue an official statement regarding their singer's passing, but well-wishers have already taken to the band's MySpace page, to show their support and to leave their condolences. Earlier this year, Space Eater, who're in the midst of finding a label home, reportedly recorded a cover of "Speed Metal Manijak" for an upcoming Bombarder tribute album slated for released late this year or early next. The band, who opened for German thrash band Destruction last month, was scheduled to share the stage this September with the likes of both Municipal Waste and Sodom. The band's last studio offering, 'Merciful Angel,' was released in 2007.